Are you unable to perform the normal operations like open, copy, download emails/attachments from your MS Outlook? Such problems arise, when the size of the PST files exceed the maximum permissible limit. However, don't worry! An efficient PST repair software can successfully repair all the corrupt over-sized PST files, so that you are again able to perform regular MS Outlook operations smoothly. It is also equally important to know why an Outlook .pst file gets over-sized, leading to inaccessibility of various mail components. What Makes PST Files Become Over-Sized? Every day, while working on MS Outlook, you send/receive a number of emails, make notes, calendar entries, add contacts etc. After months and years of usage, your MS Outlook mailbox gathers huge amount of data and the corresponding PST file grow in size. Normally, for MS Outlook 2002 and previous versions, the maximum permissible size limit of a PST file is 2 GB, whereas it is increased to 20 GB for Outlook 2003 and later to 50 GB in Outlook 2010. After rigorous use for years, the sizes of PST files exceed even this limit, thereby raising the chances of corruption. Moreover, in later versions also, it is because of this over-sized PST files, you find difficulty in sending/receiving mails, archiving PST files, moving items etc. and end-up receiving various error messages on each operation. If a PST file containing all your important emails, attachments or contacts gets over-sized and thus corrupt, the loss can be huge in terms of money as well as business. To deal with such instances of PST file corruption, Microsoft has provided utilities, such as Inbox Repair Tool and Oversized PST crop tool etc. However, when the corruption level is severe, even these utilities fail to repair the PST files and all your precious mails remain inaccessible. In such critical situations, when the inbuilt utilities fail, the power packed Outlook PST Repair tool from Stellar can help you recover large PST file, after successfully repairing them. The software is developed by a trusted name and is completely risk-free in nature. With the highly interactive user interfaces of the software, you can perform the oversized PST recovery operation in just few easy steps. How Stellar PST Repair can recover Oversized PST files? The following steps will guide you through the steps to recover an over-sized Outlook PST file. 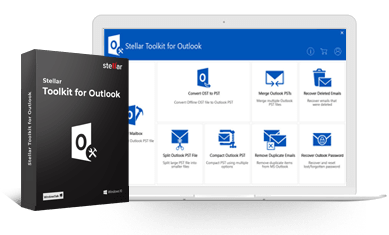 Download Stellar Outlook PST Repair and install it in your system. Double click the short-cut icon on the desktop and run the software. The main interface opens up with options to Select/Find the corrupt over-sized Outlook file. Note: Close Microsoft Outlook before the repair operation. It is not possible to recover the deleted data, once you have performed Compacting or Archiving operations. After selecting the particular PST file, the 'Repair' button gets enabled. Click it to initiate the repairing process. Note: that the time taken to repair the damaged PST file depends upon the size of the PST file as well as the magnitude of corruption. Once, the scanning process completes, the software shows the list of recovered emails, contacts, calendar entries, journals etc. Click any item and preview the content. Select the recovered items and click the 'Save Repaired File' icon to store the particular mail items at the desired location. You can save an email message either in MSG (Message form) or EML (Email Form) format. The demo version of Stellar Outlook Repair scans the corrupt PST files and shows all the recoverable items. Download the demo and see how it can recover large size PST file, before purchasing the full version for actual recovery.